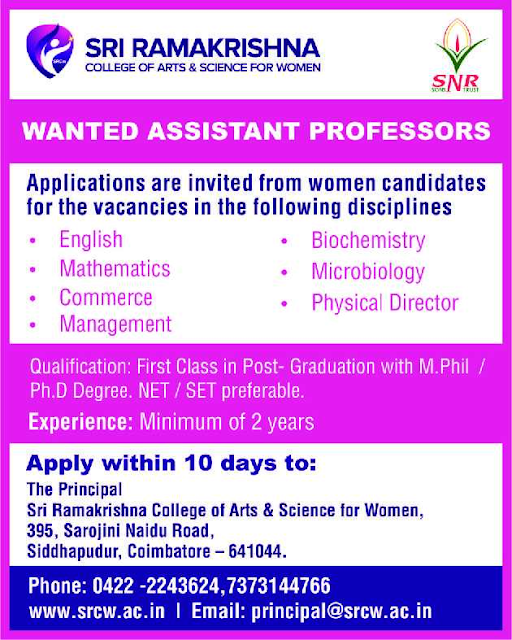 Looking for Assistant Professor jobs in Arts Colleges 2019 in Tamilnadu? or Searching for Faculty Teachers Tamil Nadu Feb 2019? A college based in Coimbatore named Sri Ramakrishna College of Arts and Science for Women, Coimbatore has advertised in THE HINDU newspaper for recruitment of Assistant Professor / Physical Director jobs vacancies. Interested and eligible job aspirants are requested to apply within 10 days from 13th February 2019. Check out further more details below. About College: Sri Ramakrishna College of Arts and Science for Women enjoys the reputation of being a most preferred women’s institution for higher learning in the city.The college is affiliated to Bharathiar University and is accredited by NACC New Delhi. MCA program is approved by All India Council for Technical Education(AICTE).Since its inception in the year 1991,the institution is growing strength to strength under the banner of SNR Sons Charitable Trust. First class PG degree in relevant filed M.Phil or Ph.D . NET / SET will be preferred.